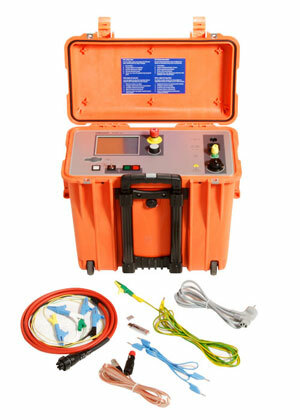 Thorne & Derrick UK are official distributors of the SEBA KMT range of LV-HV Cable Fault Location instruments including cable sheath testers and cablesheath fault prelocation and pinpointing units. Cable sheath tests are required for new cable installations to ensure cable is : i) continuous end to end, ii) cable is laid as planned and iii) route cable joints are sound. Existing cables undergo sheath testing prior to returning to service following cable diversion or cable repair to ensure circuit integrity. 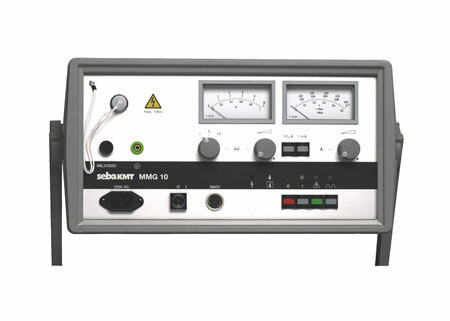 SEBA KMT Earth Fault Locator ESG80-2 - for pinpoint location of cable sheath faults with highly sensitive galvanometer and provided with an amplifier. Interfering DC voltages can be suppressed with a compensation circuit. SEBA KMT Sheath Testing, Prelocating and Pinpointing MFM 5-1 - an intact cable sheath of a plastic insulated (XLPE) medium voltage (11kV-33kV) cable is the prerequisite for the avoidance of water ingress and subsequent cable faults. The MFM 5-1 is a universal test instrument for cable sheath testing including pre-location and pinpointing of location of a sheath fault. In the cable sheath testing mode, current measurements with 1 and 10 mA full deflection can be carried out, permitting a detection of even minute insulation damage of the high voltage cable sheath. The instrument is very easy to use, being menu-driven. To get precise results of the fully automatic pre-location, only entering the total cable length is needed. The instrument will carry out a self-calibration, conduct a double measurement and display the result directly in metres. SEBA KMT Sheath Fault Prelocation MVG-5 - high voltage bridge tester provides pre-location of cable sheath faults in power and communication cables helps to reduce both the total fault location time and the thermal stress on the cable. Here, TDRs (Time Domain Reflectometer) cannot be applied, since the pulses are largely dampened by the ground. These type of cable faults can best be pre-located employing bridge methods. Conventional bridge testers are not suitable since on one hand a test voltage up to 5 kV DC is required and on the other hand a balance bridge circuit is not available. The high voltage bridge tester MVG 5 has a test voltage of up to 5 kV and is fitted with special components for bridge balancing. The components available for the pinpoint location are the burn down unit BT 500-IS-1 or MMG 5 and the earth fault locator ESG 80-2 have dual use for cost-effectiveness. Cable sheath testing is a vital tool in preventative maintenance of electricity supply to low and high voltage cable networks - a damaged insulated cable sheath will inevitably result in a cable fault causing interrupted electricity supply to low voltage and high voltage cable networks. The leakage current is measured during cable sheath fault testing highlighting deviations which may indicate a potential sheath fault - subsequent cable sheath fault location determines the distance to the actual sheath fault. SEBA KMT MFM5-1 instrument quickly limits the location of the cable fault by specifying cable length. During cable sheath fault pinpointing, step voltage measurement is used to locate the fault to carry out cable repair or jointing. An intact polymeric cable sheath is a prerequisite for the avoidance of water ingress and subsequent cable faults in low and high voltage cable networks - the prelocation and pinpointing of cable sheath faults prevent ageing, faults and stresses that are a consequence of water ingress. On new street lighting cable installations it is a requirement to validate that the cable installed has not been damaged during installation as recommended by the ILE Electrical Code of Practice and Highways Code of Practice. SEBA KMT cable sheath testing instruments identify defective cable sheaths, exposed to potential cable fault conditions, where the steel wire armour (SWA) is in contact with the ground due to outer sheath damage.